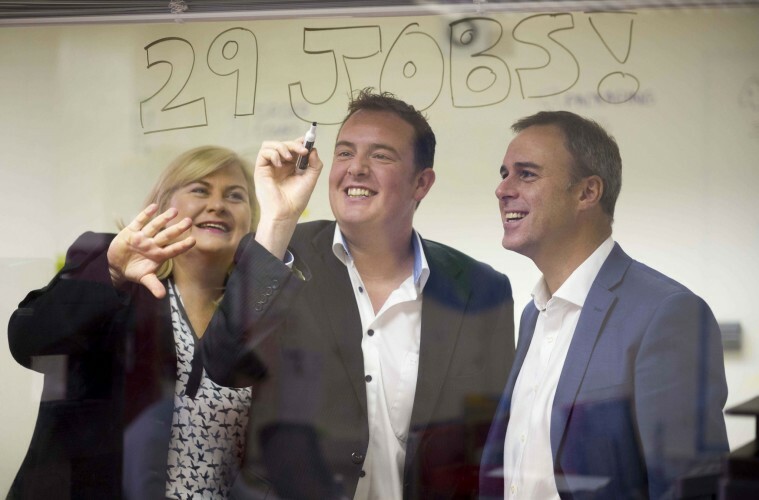 Irish company Smarter Surfaces, which sells products that can turn any surface into a functional white board, has today announced 29 new jobs. All of the positions will be filled by June 2017, bringing the total number at the company to 44. The jobs created will focus primarily on international sales, channel management and e-commerce, with the most immediate hires in channel management. The announcement comes as the company has signed a number of new distribution deals worth approximately €6 million over the next two years. This will see Smarter Surfaces expand its international reach to more than 30 countries and build on its already strong presence in Ireland. Smarter Surfaces has three product ranges, which can turn any flat surface into a reusable whiteboard, magnetic wallpaper or a projector screen, as well as combinations of these such as any wall that would have both magnetic and whiteboard functionality. The company was founded in 2012 as ‘Smart Wall Paint’. Speaking about the announcement, Denise Doran, Director at Smarter Surfaces, said: “These new jobs are a reflection of our strong and fast growth since 2012, particularly in the international market. We owe a great deal of this success to the AIB Seed Capital Fund and Dublin BIC, who have been working with us since 2013.